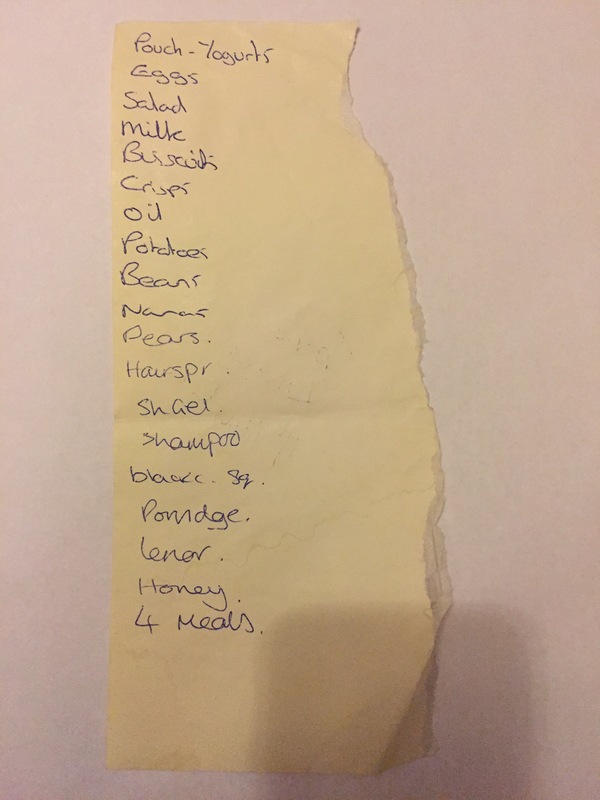 Pouch – yoghurts, eggs, salad, milk, biscuits, crisps, oil, potatoes, beans, nanas, pears, hairspr, sh gel, shampoo, black sq?, porridge, lenor, honey, 4 meals. A good healthy diet of fruit and veg with a core of hair spray, shower gel and shampoo. Were the four meals ready meals or ingredients to make four meals? What was the black square? Blacks. Sq. Might be allowing herself one square of black chocolate a day for pre- and post menstruation. Needs a bar with enough squares.